By Abegail Mendoza, ASP Program Assistant. 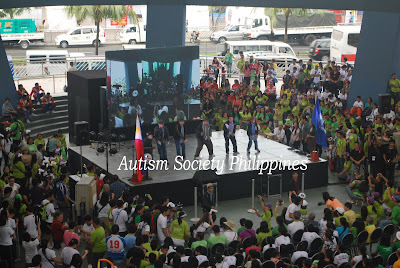 The 2012 Angels Walk for Autism broke the record as it was joined by more than 5, 000 angels at Music Hall, SM Mall of Asia in Pasay City. 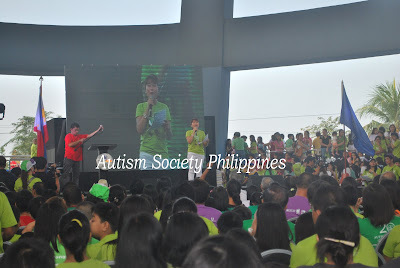 Autism Angel and President of SM Prime Holdings Inc, Mr. Hans Sy said “This is the biggest Angels Walk yet!”. The participants consist of schools, institutions, LGUs, NGOs, supporters, professionals, volunteers, and ASP Chapter representatives, friends and family members of persons with autism all over Metro Manila and nearest Provinces came to support the 16th National Autism Consciousness Week with the theme “Making the Rights Real for Filipinos with Autism” chaired by the Department of Social Welfare and Development. The walk program started with two warm up exercises: A Zumba Fitness instructor Ms Donna Lim and company led the 1st batch, followed by the teachers and families from GS Option House with the live song from the Luntayao Siblings as they led the 2nd batch. ASP Dream Girls, Thara Marie Santiago and Nica Escasinas led the Invocation followed by ASP’s own AVP for the National Anthem that features photos from the various Colors of “A” Spectrum workshops/exhibits of ASP Chapters around the country. Thara Marie Santiago gave an opening number as she sang and danced the “Price Tag” while Nica Escasinas also sang and danced the Justin Bieber song during her special number. It was followed by an opening remark from ASP National President Ms Mary Grace Adviento, she thanked all the participants who came to support the ASP’s Angels Walk for Autism and assured them that they will enjoy the entire program. SM Supermalls President, Ms Annie Garcia welcomed the participants in SM Mall of Asia. SM MOA hosted the Angels Walk for Autism for the past 3 years. SM Program on Disability Affairs Director, Engr. Bien Mateo also gladly welcomed the participants and introduce video “The HEART of SM,” highlighting SM’s Corporate Social Responsibility Projects for Persons with Disabilities. More Angelic messages followed from, AKBAYAN Representative Cong. Walden Bello who assured his support to ASP and the sector of persons with disabilities. Ms. Bernadette Cariaga, Program Officer of the Australian Aid announced their organizations support to the projects of ASP National Office and also the project of ASP Laguna chapter. More than 5, 000 participants from various schools, institutions, centers, LGUs, NGOs, supporters, professionals, volunteers, organizations and ASP Chapter representatives, friends and family members of persons with autism walked inside the SM Mall of Asia. 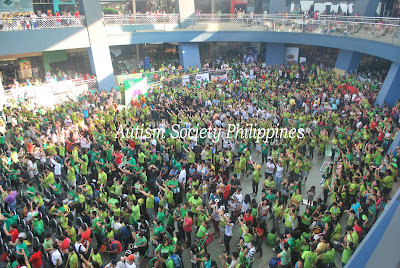 Mall goers were amazed to witness the huge number of participants of the walk. As a sign of support and cooperation, tenants from the different stores inside the mall waved their green flaglets to signify their supports and cooperation as the walk passed their location. Emcees, Ms Kismette Cepe and Mr Mike Limon recognized each group as they raised their respective banners. The Drum and Lyre from Mandaluyong City led the 2nd part of the program. PWA Vel Barria sang with her amazing acapella song. The ILLC Hunks: Paul Matthew Somera, Carlo Gregorio Veluz, Eicor Crawford Atienza, Patrick Miguel De Leon and Cornell Saranggaya gave the viewers a wonderful dance with the music “Papi” by Jennifer Lopez. From GS Option Haus, sang and danced with the tune of “Move like a Jagger” by Maroon 5. Students from Hope Intervention Center danced the “Teach me How to Dougie”. From Cavite Chapters, the Cavite Voice Quartet sang “I am Already King” popularized by Christian Bautista in the movie “A Special Symphony”. Robert Meigh "BuBoy" Dolor sang “Je T’ Aime”, a French song that means “I love you”. Also from Cavite, Lian del Rosario played his guitar when he sang “Warrior is a Child”. Last but not the least, is the ASP Dream Girls, Thara Marie Santiago and Danica Escasinas with PGT Season 1 grand finalist, the Luntayao Siblings. “Making the Rights Real for Filipinos with Autism"
Yes, the walk was the launching of the week long celebration to make the rights real for Filipinos with autism. Dir. of the Commission on Election informed the participants of the launching of their initiated to promote and realize the rights to vote of all marginalized sector including persons with disabilities. National Council on Disability Affairs Officer In-Charge and concurrent Department of Social Welfare and Development (DSWD) Under Secretary Alicia R. Bala reiterated the support of her department to Make the Rights Real of Filipinos with Autism. See you All in the next Angels Walk in 2013!